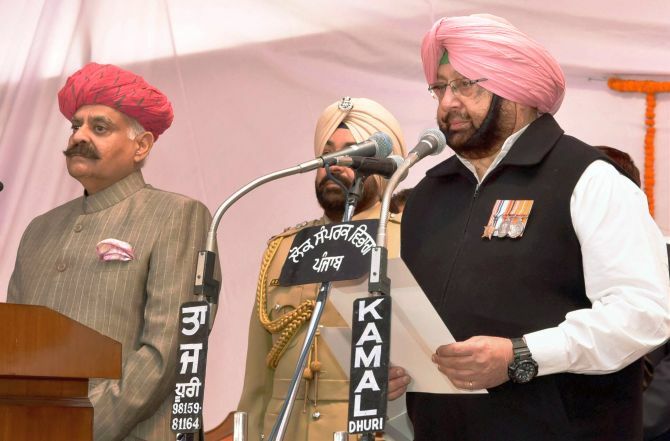 After guiding the Congress to a resounding victory, Amarinder Singh was on Thursday sworn-in as the Punjab chief minister for the second time with nine ministers including Navjot Singh Sidhu also taking the oath. Amarinder, 75, was sworn in as the state's 26th chief minister. This will be Amarinder's second stint as chief minister. Earlier, he led the Congress government from 2002 to 2007. 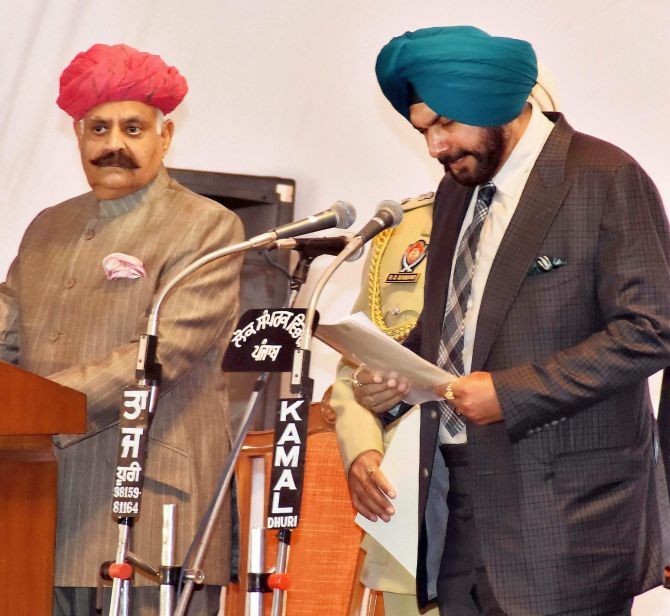 Speculation was rife that Sidhu, the cricketer-turned politician, would be given the post of deputy chief minister but he was second among the list of nine ministers to be sworn in. Brahm Mohindra was sworn in as cabinet minister right after Amarinder. Two ministers of state -- both women -- were sworn in at the ceremony attended among others by former Prime Minister Manmohan Singh and Congress Vice President Rahul Gandhi. The ceremony was held at the Raj Bhavan in Chandigarh and the oath was administered by Governor V P Singh Badnore. Sporting a black sleeveless jacket adorned with army medals, Amarinder took the oath in English. Besides Sidhu those sworn in were Manpreet Singh Badal, estranged nephew of former Chief Minister Parkash Singh Badal, Sadhu Singh Dharamsot, Tript Rajinder Singh Bajwa, Rana Gurjit Singh and Charanjit Singh Channi. Two women MLAs Aruna Chaudhary and Razia Sultana were sworn in as Ministers of State (Independent Charge). The Council of Ministers has representation from different castes, regions and religious faiths. While Mohindra, the senior-most minister after Amarinder, is a Hindu face in the cabinet hailing from the CM's home district Patiala, the rest of the cabinet ministers are Sikhs which include Charanjit Singh Channi and Sadhu Singh Dharamsot, both from the Dalit community. Among the women who have been given ministerial berths, Arun Chaudhary is a Dalit face from Gurdaspur district while Razia Sultana is a prominent leader from Malerkotla, who belongs to the Muslim community. While Amarinder Singh and Rana Gurjit Singh were the only ones to take oath in English, Mohindra and Aruna Chaudhary took oath in Hindi, while the rest took the oath in Punjabi. The state can have a maximum of 18 ministers including the chief minister. The Congress has 77 MLAs in the assembly. Amarinder Singh initially has kept the strength of his Cabinet short, leaving scope to go for in an expansion at a later stage. Capt Amarinder had announced that the oath taking ceremony would be a simple affair in view of the financial crisis facing the stage. A galaxy of Congress leaders including Himachal Pradesh CM Virbhadra Singh, Kapil Sibal, Ashok Gehlot, Bhupinder Singh Hooda, Ajay Maken, Raj Babbar, Ambika Soni, Pawan Kumar Bansal, Anand Sharma, Natwar Singh, Sachin Pilot and Asha Kumari, Pratap Singh Bajwa, among others were present on the occasion. Amarinder's wife former Union Minister Preneet Kaur and his family members were also present. Also present on the occasion included Pakistani journalist Aroosa Alam. Former UP Chief Minister Akhilesh Yadav was represented by his ex-Minister Balwant Singh Ramoowalia. Families of other ministers, who took oath, were also present on the occasion. After taking oath, Navjot Sidhu, the MLA from Amritsar-East met Manmohan Singh and Rahul Gandhi. 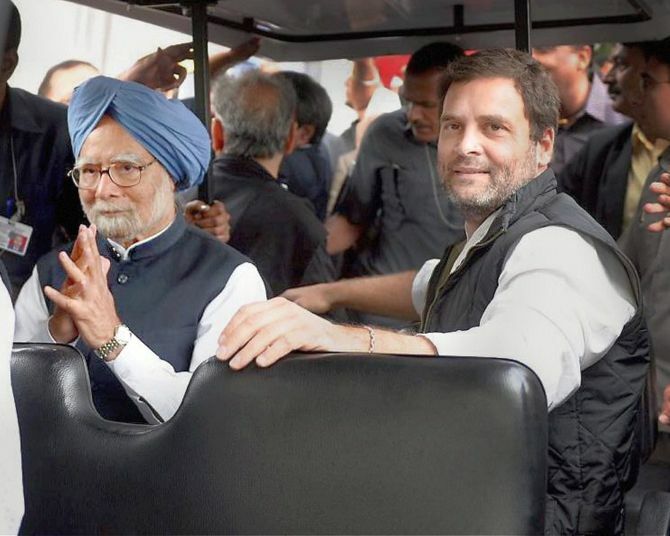 Congress under the leadership of Amarinder had won 77 seats in the 117 member Assembly elections wresting power from the SAD-BJP alliance which was relegated to the third spot with 18 seats. Aam Aadmi Party won 20 seats and two seats went to its ally Lok Insaaf Party.